EDEN PRAIRIE, Minn. — Following more tests, Adrian Peterson’s sprained right foot will not require surgery, but his availability for the Minnesota Vikings is still unknown. Peterson was scheduled to have a CT scan Monday following a magnetic resonance imaging test and X-rays, and have the tests evaluated by a foot specialist. According to a league source, it was determined Peterson wouldn’t need surgery on the foot, but his availability will be determined later after he gets out of a walking boot. 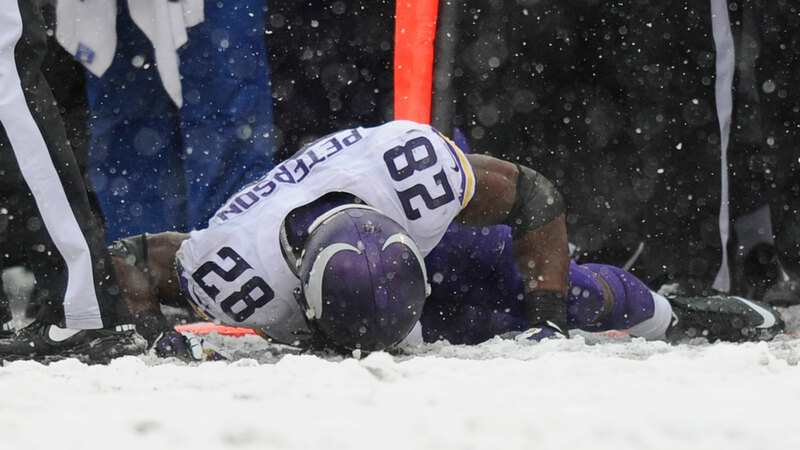 The plan is for Peterson to be out of the walking boot today, according to another source. Peterson was in the walking boot in the Minnesota locker room Monday after being injured in Sunday’s game at Baltimore, when Ravens linebacker Arthur Brown fell on Peterson’s legs and feet trying to make a tackle. "Initially you don’t know exactly what’s going on when you’re feeling it," Peterson said on Monday. "That initial contact definitely didn’t feel good. I was kind of worried. But kind of cleared up a little bit after getting the MRI. I’ll see how things play out after the CT scan." Peterson told reporters the X-rays and MRI didn’t reveal any broken bones or torn ligaments and a Lisfranc injury was ruled out as well. "They ruled that out," Peterson said of the Lisfranc possibility. "Of course that was one thing that will pop up in your mind. That’s one thing I didn’t want to hear so it feels good to have that cleared out." Peterson, who has been playing through a groin injury for the past four weeks, is the league’s second-leading rusher with 1,221 yards. Philadelphia’s LeSean McCoy, who had 217 rushing yards on Sunday, leads the league with 1,305 yards. No 2,000-yard rusher, as Peterson was last season, has ever led the league in rushing the following season. He had just 13 yards rushing on seven carries Sunday in the snowy conditions before leaving early in the second quarter with the injury. Peterson said Monday expects to play Sunday, but coach Leslie Frazier wasn’t sure when Peterson might be able to return. "Until I get more information this afternoon, it’s hard to say," Frazier said. "Hoping, as we all are, that he’s able to get back on the field soon." Backup Toby Gerhart is dealing with a hamstring injury, which occurred on a 41-yard touchdown run that temporarily gave the Vikings the lead in Sunday’s back-and-forth game.